For the estimated range of costs, MOD Pizza relied on the historical operations of the MOD Pizza Restaurants owned and operated by affiliated entities. Payments are not refundable unless otherwise noted. MOD Pizza does not offer direct or indirect financing. These estimated costs are to build an existing building or space to meet the image and decor requirements for MOD Pizza Restaurants. Costs for leasehold improvements will vary greatly, depending upon the location, condition, layout and content of the site, labor and material costs, and landlord provided work (tenant improvement allowance). These leasehold improvement costs assume that the delivery of the space includes the requirements described in MOD Pizza’s standard landlord work letter. 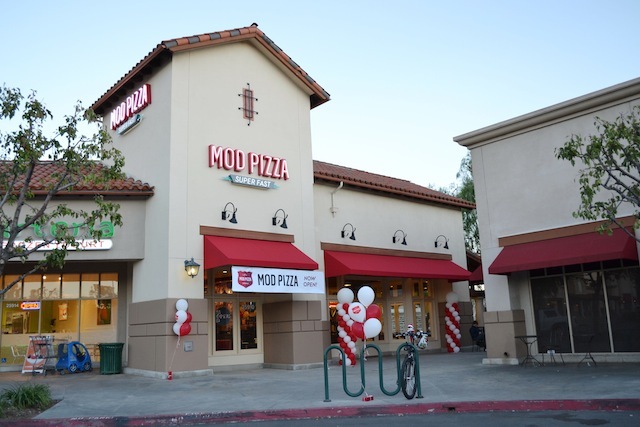 MOD Pizza Restaurants will typically be located on an end-cap or in-line space within shopping centers, and generally require from 2,600 to 2,900 square feet of floor space. The cost per square foot of leasing commercial property will vary considerably depending upon location and market conditions. This estimate does not provide for the purchase of land or the construction of a building. If you buy unimproved real estate and construct your Restaurant, the total estimated initial investment for your Restaurant will be significantly higher. You must pay for the salaries and benefits, travel expenses, and other expenses while you and your management staff attend the training program. This includes the cost of kitchen and beverage equipment, registers, booths, bars, small wares, office equipment, and supplies. Your furniture, fixtures, decor, and equipment may be financed through a bank or other financial institution, leased or purchased outright. This includes the cost of the computer hardware, peripherals, and software that will serve as your point-of-sale computer system, and the maintenance agreement for that system. Beer and wine license costs will generally range in the amounts stated. However, in certain states and municipalities, the cost may substantially exceed the stated amounts. You should check with the local licensing regulatory agency to determine the cost of your beer and wine license. If your actual out-of-pocket costs of obtaining a liquor license for your Restaurant exceed $25,000, the franchisor may, in its sole discretion, not require you to obtain a liquor license. Miscellaneous fees include such items as security and lease deposits, utility and license deposits, impact fees, commissions, permits, miscellaneous professional fees to acquire or lease the premises of your Franchised Location, and other accounting and legal fees. You should check with the local regulatory agency that issues building permits to determine what impact, connection, or other site development fees may be required for the specific site for your MOD Pizza Restaurant. You must spend at least $10,000 on the grand opening of your Restaurant within the first 90 days of operations. During the first three months of operations, you will need additional funds to cover your expenditures for food and beverage inventories, fees due under the Franchise Agreement, local marketing, utilities, supplies, uniforms, lease payments, insurance, and other miscellaneous operating costs. This estimate has not been offset by any allowance for your operating revenues during this three-month period. Your working capital requirements may increase or decrease depending upon your geographic area, number of employees, labor rates, minimum wage laws, and other economic factors. For the estimated range of additional funds that you will need during your first three months of operation, MOD Pizza relied on the initial operations of the MOD Pizza Restaurants owned and operated by affiliated entities. These figures are estimates only and it is possible that you may have additional or greater expenses during this period. If you only want 1 franchise, there is no need to contact MOD, who will not be that interested in your offer. Their operation is not that difficult and if you want just 1, do it yourself, and save a ton of money.